After a vacation down the shore with my family, we are just now recovering from a week of sand, sun, waves and more sand… lots of sand. In a house filled with eight adults, two toddlers and one newborn, it wasn’t the most relaxing vacation, but it certainly was a lot of fun. We take a trip to the Jersey shore every year with my mom’s family, but this was the first year we had a toddler on our hands. I had a particular vision in my head about how the shore trip would unfold with an almost two year old. I imagined lounging on the beach, smiling while as I observe W happily sifting sand with his dump trucks. We would munch on our perfectly-portioned healthy snacks after my easy, morning jog on the boardwalk taken while Good Papa & W sleep in. There would be blissfully long naps…. I have come to realize that when it comes to the many facets of motherhood, things never go as planned. Fantasy- After a long day in the sun, my exhausted toddler would crash like a log leaving me with ample time to exercise and relax. Reality- The long days in the sun only lit a spark in my toddler. He’d fight every nap and bedtime as if he’d never see his beloved beach again. He’d greet us with a smile and an ear-piercing battle cry at 5:30 am to start the day. *A special thank you goes out to my parents who gladly watched W while we got in a few more moments of shuteye. 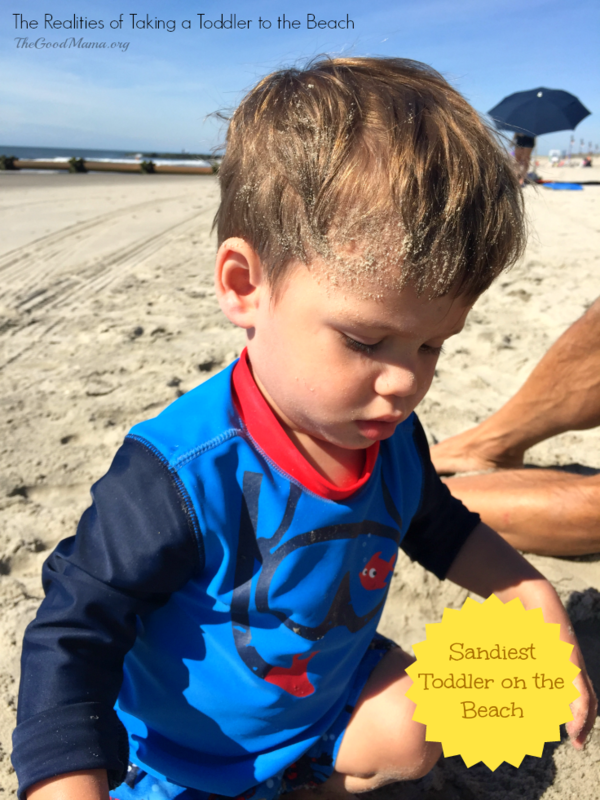 Fantasy- Armed with an entire list of fun, toddler activities to do while playing in the sand, my toddler would be entertained for hours without ever leaving the comforts of our beach blanket and shady umbrella. There would be no need to worry about him ingested any sand since he is beyond the “putting everything in his mouth” stage. And, what about all those fun, toddler sand activities? We did a few, but I was mostly too tired to even think about orchestrating any games. Fortunately, the beach is one giant playground! Fantasy- After some time in the sand, my toddler and I would casually stroll down to the water and jump in the waves hand in hand. Reality- To my surprise, my water baby was not so into the big ocean. I’ll admit I was a bit relieved that I no longer had to stress about a big wave or shark (!) taking my baby off to sea. Though I quickly realized my son’s habit of running wild on the beach, interrupting paddle ball games, entering other families’ tents and waking up sleeping bikini-clad girls was not much better. Fantasy- My bath-loving, shower-loving toddler will eagerly jump at the chance to rinse off all that sand. 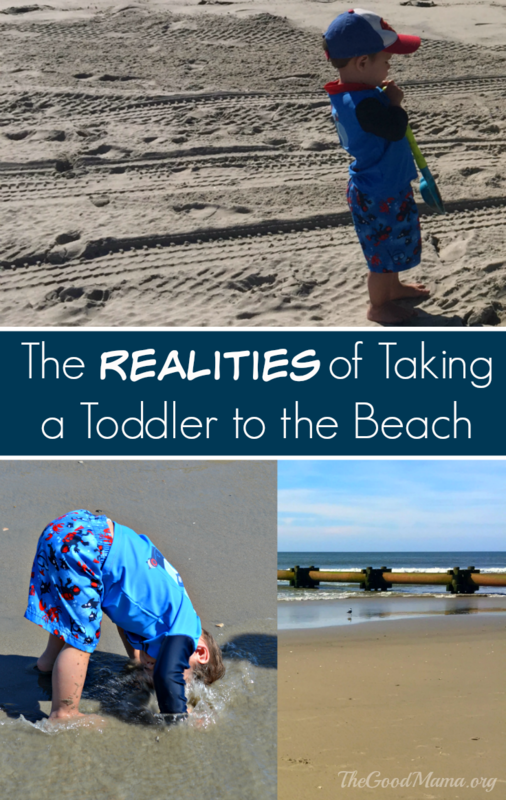 Reality- Apparently the title of “sandiest toddler on the beach,” only goes to toddlers who are not only able to cover their entire body, but who are able to keep that sand plastered on permanently. We tried spraying him with a hose, we tried showers, we tried baths. NOPE! W would have preferred to sit with a pound of sand in his pants for the rest of his life. Fantasy- I packed enough fresh fruit and vegetables to stuff my toddler with that he couldn’t possible notice all the delicious smells coming from the boardwalk or all the tasty treats Grammy was sure to pack. 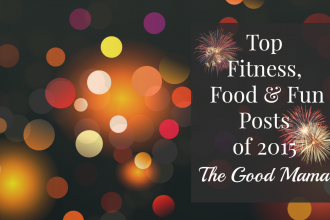 Reality- If you read my blog, then you know I’m all about healthy eating. While W did have plenty of fruits and vegetables, that didn’t stop his grandparents, aunts and uncles from “sneaking” him a variety of treats. It doesn’t help that he’ll say “COOKIE” periodically throughout the day in hopes someone will oblige him. I must confess W wasn’t the only one eating more than his fair share of sweets. Don’t put a pregnant lady a block away from an ice cream parlor! Fantasy- With all the fun games and activities I have planned for the toddlers, we wouldn’t even dream of turning on the TV. Reality- When your toddler and his cousin decide 5:30 am is an appropriate vacation wake-up time, TV is crucial. While I’m pretty anti-TV for the most part, I was totally willing to give in on vacation. My parents, God-bless them, would take the toddlers every morning, feed them breakfast, and drink their coffees while they played Mulan from netflix. Yes, they played Mulan every, single morning. I’m fairly certain my son has a crush on Mulan. Fantasy- As the peaceful ocean sounds fill the air, I would lay back in a comfy beach chair sneaking chapters of a good book and chatting with my family while watching my toddler play in the sand without a care in the world. Reality- I didn’t even bring a book with me. I have been a mother long enough to know that most fantasies are not destined to become reality with a toddler in tow. Fortunately, one of the greatest bonuses of vacationing with your large family is having plenty of help on hand. W spent much of his beach time playing around with my parents, brothers, cousins, aunts and uncles. He was in Heaven and so was I. My eight month old daughter will sleep soundly in the stroller while my much older, much wiser almost three year old will finally be able to play all those games on that beach bucket list…. Oh, I can only dream. Anyone else take a toddler on vacation? Let me know about your experience in the comment section below. Best vacation ever! My favorite part was singing all the Mulan songs (quietly) every morning with the cutest grandkids on earth. Can’t wait for next year! Trisha, I am so proud to have you as my niece. You are such a great mom to W. And you have that eternal smile! Nothing sticks to a person better than sand! That stuff is impossible to get off. We’re heading out for our first beach day of the season tomorrow and I’m pretty excited. Annelise still needs quite a bit of supervision, but at least they’re all starting to get a bit more independent! 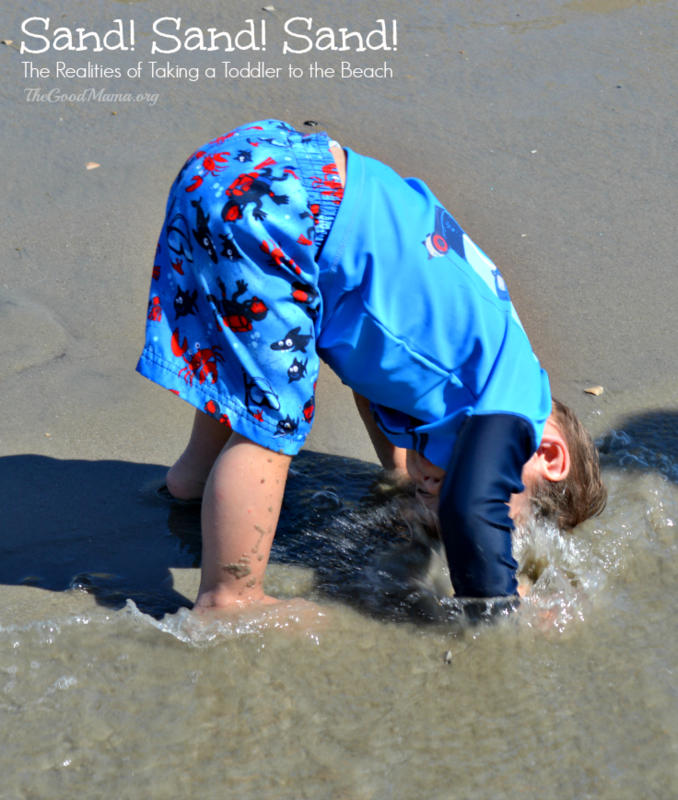 Love that picture of W putting his head in the sand/water. My three-year-old will now actually sit in the sand for awhile and play with his sand toys…so perhaps your fantasy may come true. It seems we were on the same wavelength with our vacation posts! No…things never go as planned. We just have to lower our expectations and go with the flow. So incredibly tough! Glad you survived! I hear ya! 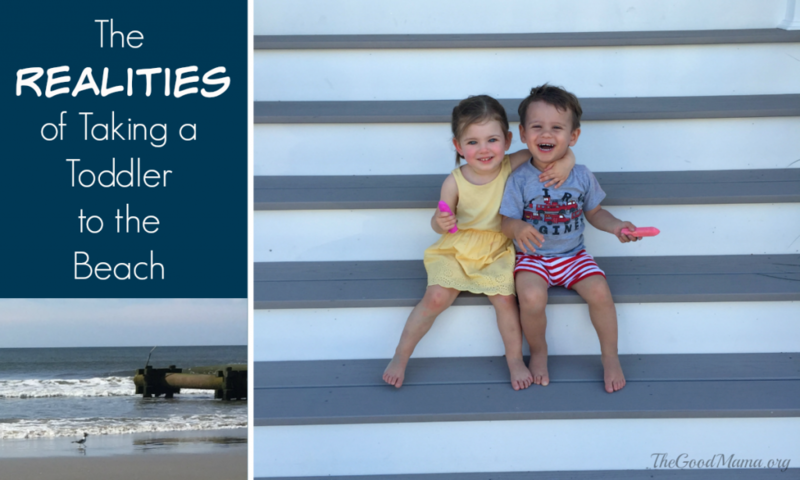 We go to the Cape every summer, and I’m dreaming of the day I can sit with a book while my kids play together without needing constant intervention. Feels a long way away! We also belong to a beach club, and three months of the year my house is covered in sand. Oh well, it’s all fun! Yes, it can be a pain, but it really is worth it. A beach club sounds so nice! This is so hilarious!! I do the same thing. I have a perfect fantasy in my mind and then it all goes out the window. Our toddlers have other plans! I’m glad you were able to still relax a bit. That picture with W sticking his head in the water is priceless!! I should really know better by now! haha Thank you! Oh yes- the sand. I think there is STILL sand in my car from last summer’s beach trip! Those outdoor showers just didn’t do the trick! He is definitely the #Sandman. He brought quite a few if us a lot if joy last week. His cousins have lots of stories about how cute he was! We took our 3yr old and our 18mos old to the beach last year (and I was pregnant with our third kid). They were afraid of the ocean too, but they loved playing in the sand. I think we lucked out though, because they were happy to take a bath each night, and they were exhausted at bedtime. I’m glad you had your parents to help out in the mornings. 5:30am is so early! Oh that sounds so nice, Nicci! Hopefully my son will get the concept of “sleeping in” by next year when he’s almost 3 haha We’ll see! We live in south Florida and the beach is a few minutes away but I never go. My son hates sand and it’s unbearably hot anyways. We usually stay indoors. I dream of a day where I can sit with a book by the water with the little one playing with all the beach toys I’ve bought for him and have never used.